Anyone else do any bellydance accessories??? Or anything of that nature??? I would love to make one of these....they would be perfect for this craft fair I am doing....any chance of a crochet tutorial? I apologize in advance, this tutorial will probably be crappy b/c I don't have any experience writing patterns. Yarn: 2 contrasting colors of Red Heart Super saver. (approximately 1/3 of each skein was used for mine and I'm about a size 8/10) Feel free to use more than 2 colors if you want though! Notions: Some kind of ribbon or lacing that you like. I prefer a contrasting color. -So the important thing to know how to do is how to wield a double sided crochet hook. You want use the double sided afghan stitch for the base of the belt. NOTE You will be working from one hip across to the other. So you are working sideways. The belt base is made of two pieces. A front panel. And a back panel. As far as how many rows to make I just sort of eyeball it. I try to make sure the back panel is longer than the front panel to accommodate my big @$$ and hug over it. You want it to be the width of you hips, where you can feel your hip bone jut out. See pics for more clarification. Stop adding rows when it feel like it will stretch comfortably across your hips. For shaping of the belt we want it curve ever so slightly so it will hug the body and lay flat. 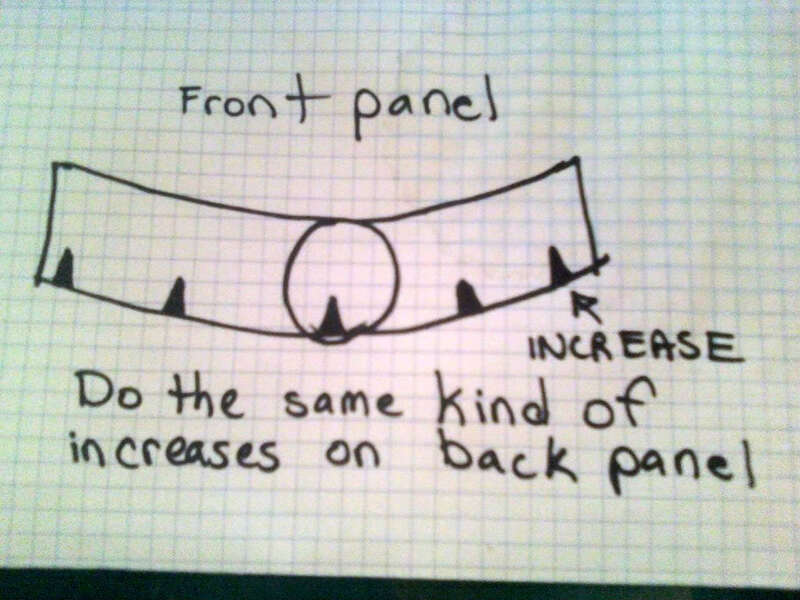 To achieve that I basically did 1 row increases in various places on the bottom portion of the panels. So when you are done with the panels just do a nice slipstitch all the way around the belt in the contrasting color to create a boarder. So anywho. 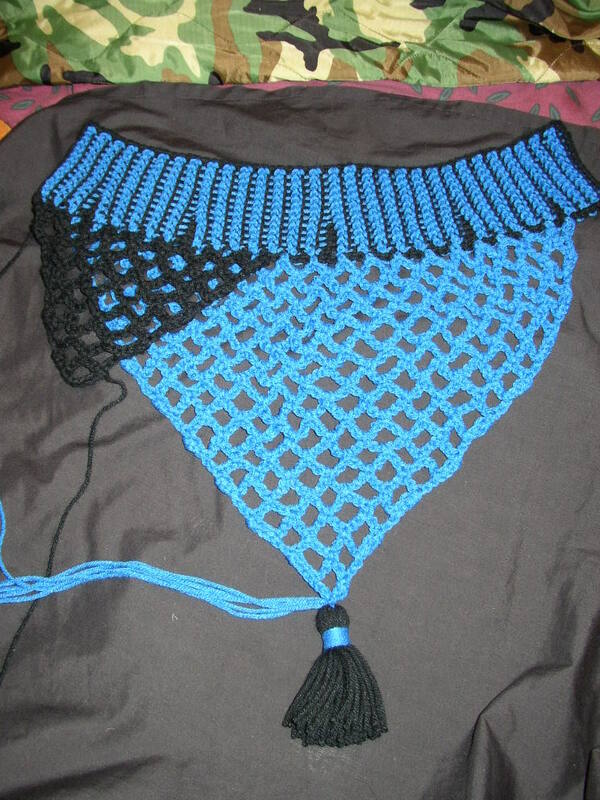 After the panels were done I just crocheted a net sort of design directly into the belt. Those are the triangular pieces. Basically to do that I crocheted directly into the slipstitched border at the bottom of the belt. 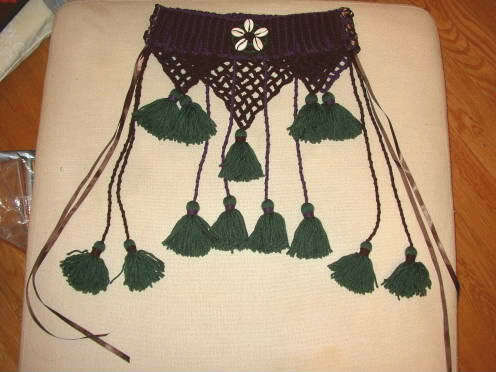 - Basically you will need multiples of 4 (+1 extra stitch) for the netted portion. Row 1: Chain 7, skip 3 stitches work into 4th (should be 3 empty stitches between), single crochet into stitch. Repeat until desired width is reached. Turn. Row 2: Slip stitch next 4 stitches. *Chain 7. Single crochet over next chain area in the middle. 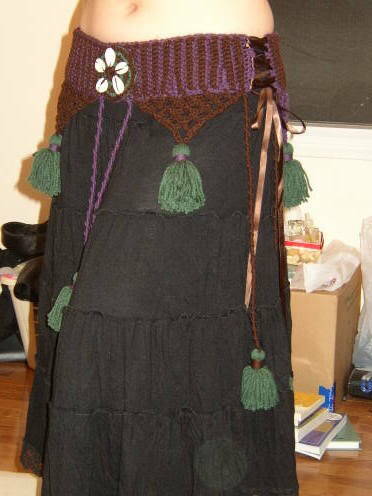 (No need to work into actual chain, just crochet around it. )* Repeat from * until you have worked across all chain spaces. Repeat Row 2 until you have made a complete triangle. It will get narrower as you go until it reaches a point. 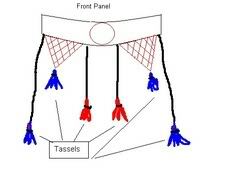 Here is a rough sketch of the net pattern. It's a really rough sketch so it doesn't include the slipstiches. Also, I realized that there is an error in the chart. 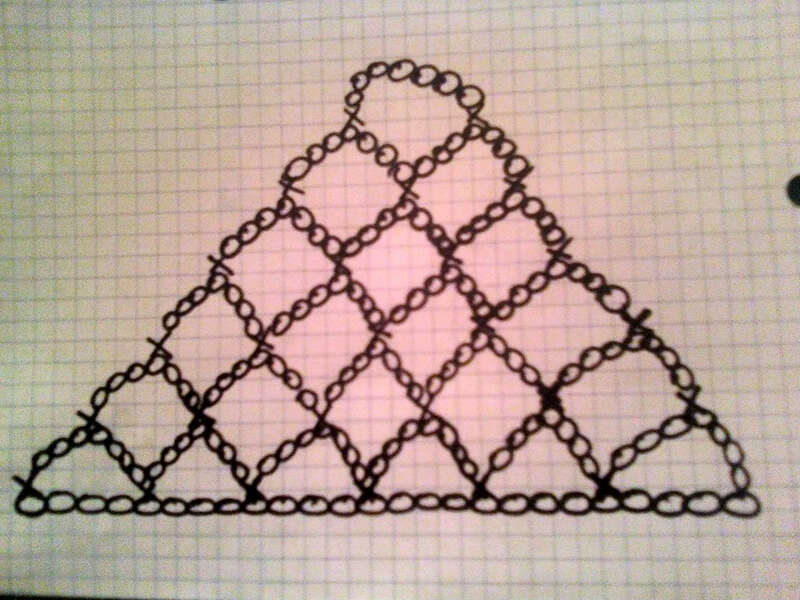 The first chain space should lead from a chain stitch not a single crochet. But it doesn't make much of a difference. 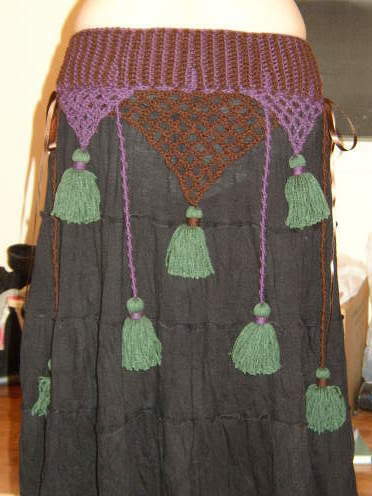 Then you weave some ribbon through the two sides of the panels (after you lay them out w/ insides touching each other) as if it were a corset and VOILA! You have an adjustable belt! 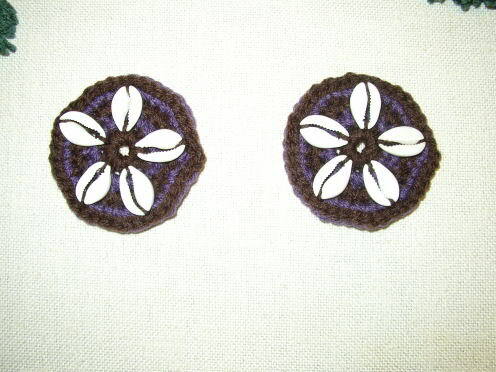 For the circle medallion thing on the front of the belt I just crocheted a flat circle in alternating colors and sewed some shells on w/ a yarn needle. Yours are gorgeous-what a lucky friend. wow those are georgous you did an awesome job on it. I wish I was the friend who was getting them. 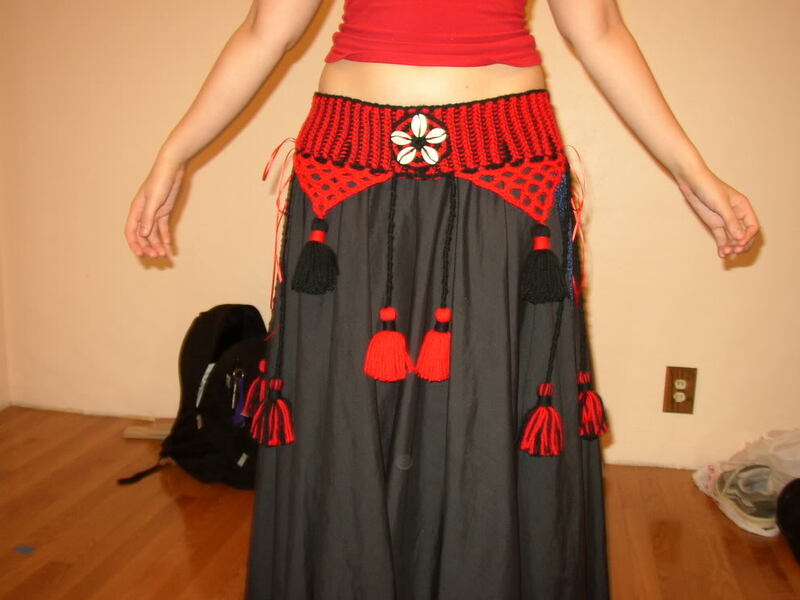 I took a couple of belly dancing classes last year, hopefully I'll be able to take some this Fall. (evil college... >.<). Maybe try taking some in the summer time (when school is out?). Ohhhhhhh how pretty .. you are very talented!! Incredibly cool. I hit this rocks on it. I think my daughter wants me to make her something like it now. Just gorgeous! You're very talented. I'm currently rethreading my coin belt for belly--every time I'd shimmy about eighteen coins would fly off. Since I'm going to be teaching a little next year, that might be somewhat embarrassing. I also have friends who made their own bling, and modified lots of other things to fit their belly style. I like yours quite a lot! Check out my hand-dyed fiber!